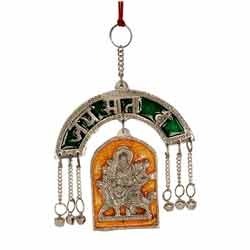 Pioneers in the industry, we offer White Metal Wall Hangings such as Meenakari Laxmi Ganesha Hanging, White Metal Wall Hanging Kalash, White Metal Gayatri Mantra Wall Hanging, White Metal Durga Wall Hanging, White Metal Wall Hanging Om, White Metal Wall Hanging Krishna and many more items from India. We are manufacturing Silver and Golden Plated Swan Pair and more Decorative Tablewares in fine hand carving work in Oxidized Silver Golden finishing. We are manufacturing a range of white metal wall hanging in meenakari and antique finishing. 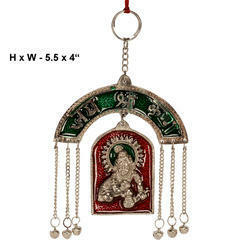 We are manufacturing and exporting a wide array of White Metal Wall Hanging Krishna. Our offered exclusive range of White Metal Wall Hangings are made up of oxidized and meenakari Work. These are available in numerous designs, colors and patterns. Our range of wall hangings are appreciated for their lusture and durability. We are engaged in manufacturing of an exclusive range of White Metal Wall Hangings with oxidized and Meenakari Work. 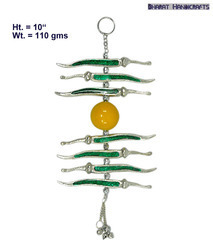 These wall hangings are made up of superior quality white metal and are having perfect finish. These are offered to our clients at reasonable rates. 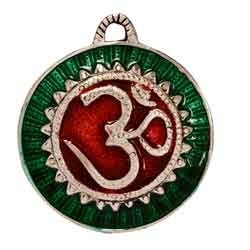 We are manufacturing Silver Plated Om Hanging with Meenakari Work and more Religious Items in fine hand carving work in Oxidized Silver and Oxidized Gold Finishing. We are manufacturing and exporting a wide array of Silver Plated Wall Hanging. Our offered exclusive range of White Metal Wall Hangings are made up of oxidized and meenakari Work. These are available in numerous designs, colors and pattens. Our range of wall hangings are appreciated for their lusture and durability.